Tamer Union: The Original Name of Digimon was "Otokotchi"
"LADIES AND GENTLEMEN HERE COMES TIME TO WATCH VOLCANO CHANNEL YEAH!" November 20th, 2015. Original Digimon series project director Volcano Oota launched his YouTube channel "Volcano Channel" this morning, uploading his first videos detailing the history of the Digimon franchise. This time Oota focused on the original Digital Monster series of virtual pets, drawing from his memories of development. In his first video, Oota lectures on the bricklike design of the Digital Monster pet, and how his team eventually settled on the name Digital Monster for its "cool" factor. Notably, at one point he says the Digital Monster pets only went up to version five, ignoring the version six pet released exclusively in Australia; Oota likely had no involvement in its development due to it being a Bandai Asia original product. Each video contains a small quiz, and for his first video Volcano asked viewers a multiple choice question, using a set of arm curling as a timer: "What was the working name for Digital Monster?" The answer is A.) Otokotchi, from the Japanese word Otoko "boy" and the existing franchise Tamagotchi (Tamago "Egg" + Uotchi "Watch"). The Otokotchi name came from the Digimon pet's origins as a boy's Tamagotchi. Hence, it can be thought of as a "Boy's Watch" as well as a Digital Monster. In the second episode, Oota explains that the pixel measure of the original devices' screens was 16x32, but the actual monsters were only 16x16. He continues to a second quiz, using shoulder presses as a timer; how many evolutionary levels were programmed into the digital monster pet? The answer is fourteen. One Baby I, one Baby II, two Child, seven Adult, and three Perfect Digimon. Volcano went on to talk a bit about "master" Watanabe Kenji of WiZ's illustrations for the Digital Monster pets. Oota worked closely with Watanabe during the pets' development, coming up with the monsters Watanabe illustrated. Oota Kensuke is the original project director for the 1997 Digimon virtual pets, who has continued to work with Digimon to the present day. Serving as a lead developer for all Digimon toys up to 2007, Oota came back to prominence in 2014 due to his involvement in the development and release of the Digivice Ver. 15th. 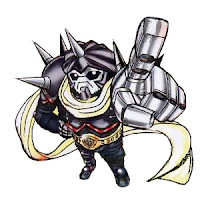 His personality "Volcano Oota" was originally created to promote the D-1 Grand Prix tournaments, and has remained a memorable component of his public persona for almost twenty years. 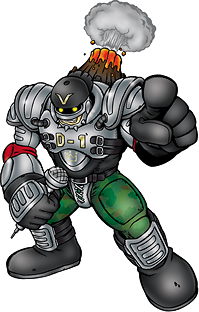 In 2000 his character was made into an official Digimon, Volcamon, and in 2002 given the Ultimate form Pile Volcamon, corresponding to his "Pile Volcano Oota" upgrade.